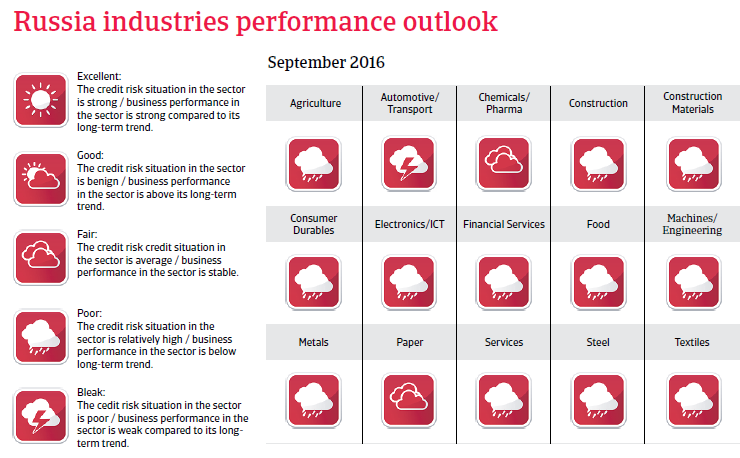 The economic contraction continues in 2016, as investments and private consumption contract further. Only in 2017 a very modest rebound is expected. The popular standing of President Putin increased significantly since the outbreak of the Ukraine crisis and the annexation of the Crimea, and approval ratings remain high, despite the current economic recession. Nationalistic sentiment has risen, supported by aggressive propaganda through the state-controlled media. Playing the nationalist card, especially in relation to the EU and the US, appears to be the key to keeping approval ratings up. Any opposition has been marginalised by a hardening of authoritarianism: hardliners have effectively been given license to attack liberals and crack down further on independent media and non-governmental organisations. The upcoming parliamentary elections in September 2016 will be tightly managed and will most likely keep the current government in control. Since the outbreak of the Ukraine crisis in early 2014, the relationships between Russia and the EU and US have gradually deteriorated. Russia´s intervention in the civil war in Syria added another area of conflict to the already strained relationships. Moscow´s annexation of Crimea in March and its tacit support of separatist forces in Eastern Ukraine triggered several rounds of sanctions from the EU and the US, mainly in the form of a freeze on assets, travel bans on Russian and Crimean individuals, long-term financing limitations restricting access to EU/US capital markets for major Russian banks and some oil and defense businesses. Restrictions include certain types of products exported to Russia, including dual-use technologies and high-tech equipment for the oil industry. Russia itself imposed retaliatory sanctions on the import of food and agricultural products from the EU, the US, Australia, Canada and Norway. The EU/US sanctions may have a very significant impact on the Russian economy in the longer term. In particular, they will influence the refinancing capacity of major domestic corporations and banks. The Russian economy contracted 3.7% in 2015, as the persistently low oil prices continued to negatively affect export revenues. Both investments and private consumption recorded sharp decreases of 9.4% and 7.7% respectively. Only net exports contributed positively to GDP, as imports decreased sharply (down 28% year-on-year) with domestic demand contraction. Consumer price inflation increased to more than 15%, which was also due to the on-going sanctions that Russia has imposed on EU imports. This, together with the rouble depreciation had a damaging impact on household consumption. That said, unemployment is set to increase only modestly in 2016, as the Russian state supports firms and directs them if needed. Firms simply often impose wage cuts rather than mass redundancies to cope with demand decline. This serves to avoid potential social unrest. The economic contraction is set to continue in 2016, as oil prices are expected to remain low for the time being. 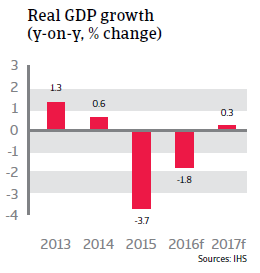 GDP is forecast to shrink 1.8% in 2016, with investments and private consumption showing further contraction and inflation remaining high. Only in 2017 a very modest rebound of 0.3% GDP is expected. In terms of exports, Russian corporate foreign debt is one of the highest among emerging economies. This is compounded not only by high interest rates, pressure on capital flows and the rouble, but also international sanctions that severely hinder foreign (re)financing. Therefore, despite the relatively deep coffers of the Russian state, Russian foreign corporate debt is indeed an issue to be watched carefully. Most vulnerable in Russia are corporates operating in the construction and real estate sectors, which generate incomes denominated mainly in rouble, but used to rely on foreign currency funding, and companies in the transport sector (particularly airlines and automobiles). Russia´s short-term economic policy in the current recession is rather prudent. 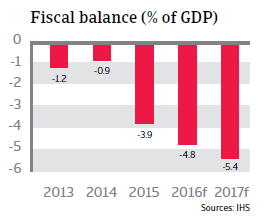 Despite a very low public debt of 13% of GDP and pressure from the low oil prices on the budget, the government deficit is kept within acceptable margins. The central bank pursues a tight monetary policy in order to combat inflation and inflation expectations, keeping rather high interest rates of more than 10% in place, which may be eased if inflation comes down with the expected gradual oil price climb. At the same time, the central bank allows the rouble to float. This has an impact on inflation if the currency depreciates, but also acts as a shock absorber for the current account, which is expected to remain in surplus in 2016 and 2017. At the same time the fairly large international reserve position of Russia hardly erodes as capital outflows are contained. That said, the long-term prospect for higher and sustainable growth remains subdued. The Russian business climate is plagued by uncertainty regarding property rights, a weak transport infrastructure and lack of competition in goods and services markets. The authorities failed to seize the opportunity during the windfall years to strengthen Russia’s economic structure and enhance its non-oil potential by prudently investing high oil revenues in other industries to diversify the economy away from the dominant oil and gas sector. There is an underlying deterrent for investments, which are badly needed to modernise the energy sector and help to diversify the economy. 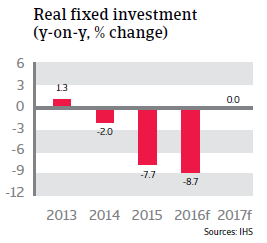 Even before the outbreak of the Ukrainian crisis, the investment level was too low and foreign direct investment too limited, partly due to due to an unfriendly business climate and a firm grip of the state on large parts of the economy. This is now exacerbated by the international sanctions imposed by the EU and the US that aim to prevent technology transfers and financing to Russian firms, especially in the energy and military sectors. 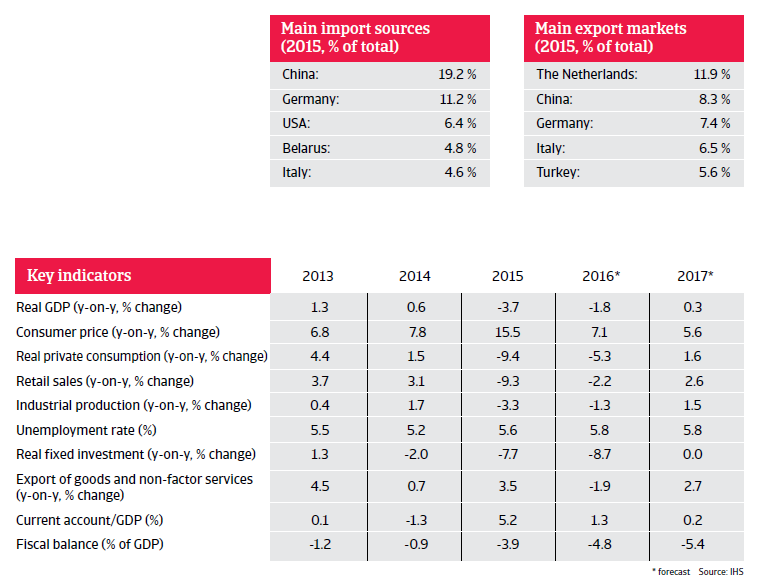 Russia remains an important market in the global economy. The ten principles of the report are meant to help businesses mitigate risks when exporting to Russia.